Fees include lunch and snacks; A $25.00 non-refundable intake fee is required. to operate, without discrimination, a supervised adult day care program providing a safe, healthy environment with opportunities for social interaction, recreational activities, and mental stimulation. Feel free to contact Waipahu Hongwanji Adult Day Care Center if you have any questions about the eligibility requirements. 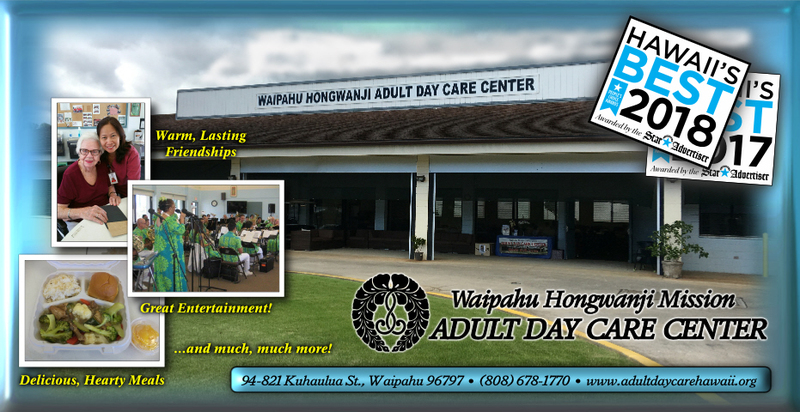 Located less than a mile from Waikele Shopping Center, this Adult Day Care Center is the first center statewide of the Honpa Hongwanji Mission. The staff is comprised of a registered nurse, certified nurses, and/or activity aides experienced in working and dealing with the elderly in a compassionate, caring and professional manner. The Waipahu Hongwanji Adult Day Care Center is licensed by the State of Hawaii - Department of Human Services and undergoes yearly inspections held by the State.